Pad Grip - The iPad Stand That Also Mounts Anywhere - Pad Grip Launches with a Mission to Free the iPad from the Couch - After months of development, a small startup based out of San Luis Obispo, California has created the Pad Grip iPad Mount, an all-purpose iPad stand that mounts anywhere. Arising out of the co-founders’ own business iPad needs, the Pad Grip can stand on its own or be mounted to nearly any surface with available wall-mount and suction cup accessories. 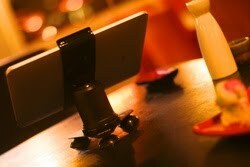 The Pad Grip swivels 360° and tilts 70° for viewing the iPad from any angle. It turns the couch-friendly iPad into a serious workstation, a mount-anywhere TV, or even a gaming table. 1. Simple, clip-in bracket requires no special iPad case. 2. 360° of swivel and 70° of tilt means it’s the most versatile iPad stand available. 3. The Atlas Accessory allows the Pad Grip to mount an iPad to any drywall or wood surface. 4. The Gecko Accessory provides a strong, suction-cup mount that’s great for tabletop mounting the iPad for use in the home or office. 5. Made in America out of space-grade polymers and cold-rolled steel. The Pad Grip makes the iPad useful to a far larger market in business, health care and the home. It can turn an iPad into a business analytics dashboard, a bedside screen for monitoring patient data, or a kitchen command center. It’s what you make it. The Pad Grip is proudly engineered and made in California, and has an MSRP starting at $69.99. The Pad Grip 2, compatible with the iPad 2, will be available on the iPad 2 launch date of March 11.